First, I'll define the top left dot of the empty middle square as dot 1, and the bottom right dot of the empty middle square as dot 2. 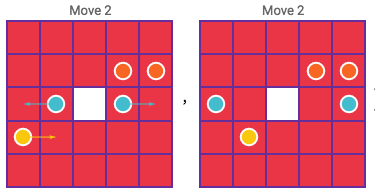 Left being <, right being >, up being ^, and down being v, what set of these moves can guide the two dots to land on the portals at the same time? (0) The two side-by-side dots are the portals. Remember each time you move dot1 and dot2 move, excepting the cases where it's not allowed. Note that in the initial configuration, both dots are at a 180° degree rotation of each other around the centre square. 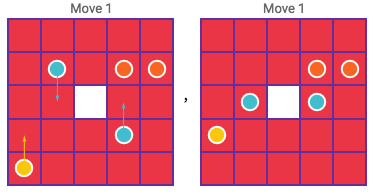 Since the two portals are not at 180° rotations of each other around the centre square, it is impossible to get both dots on a portal at the same time. 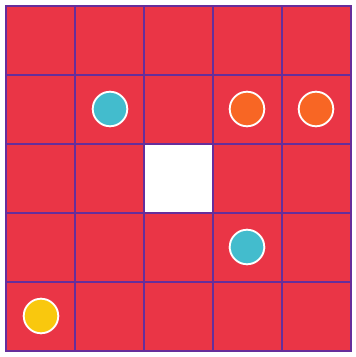 The absence centre square doesn't even matter - neither of the other dots can move onto it since then both would move onto it, which is explicitly forbidden by the rules.